Chapter 1："The Snows of Summer"
The Reign of Winter Adventure Path begins with an exciting new adventure from RPG Superstar winner Neil Spicer！ Every 100 years, the Witch Queen Baba Yaga returns to the nation of Irrisen to place a new daughter on the throne, but this time, something has gone wrong. Far to the south, winter cloaks the forest near the village of Heldren with summer snows. The heroes venture into the wood and discover a magical portal to the frozen land of Irrisen, whose supernatural winter will soon engulf all of Golarion unless they can discover the fate of the otherworldly witch Baba Yaga—a quest that will take them through snowbound Irrisen to even stranger lands beyond. 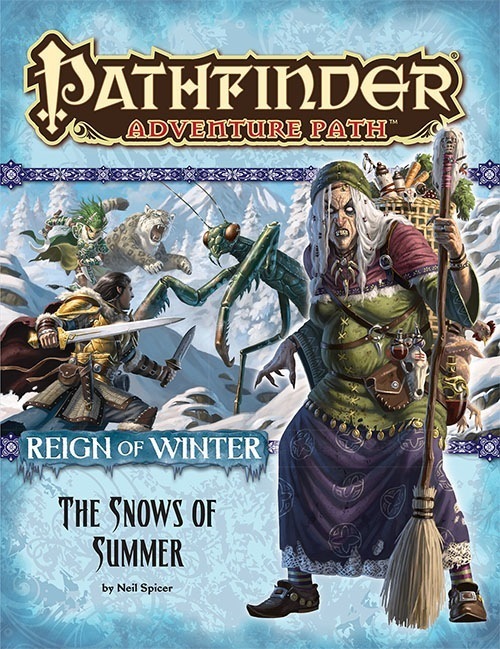 “The Snows of Summer,” a Pathfinder RPG adventure for 1st-level characters, by Neil Spicer. A gazetteer of two villages—one in Taldor and the other in wintry Irrisen—to help flesh out the characters’ environs, by Rob McCreary. A look into Irrisen’s legacies and mysteries GMs can use for this campaign, written and compiled by Rob McCreary. An alchemist’s journey to Irrisen’s capital of Whitethrone in the Pathfinder’s Journal, by Kevin Andrew Murphy. Four new monsters, by Neil Spicer and James Wilber.